The Government of Côte d’Ivoire runs a new public web portal dedicated to administrative procedures. It gathers all existing administrative procedures, available online or not. The portal also provides all Ivorian agencies with a reliable tool for achieving best Administration-citizen relationship. Regarding online procedures, the website gives access to all useful information and shows the direct link to go through the online procedure. Regarding procedures not yet available online, you will find all necessary information so that you can prepare your file and be ready when coming to the agency’s office to initiate the procedure. 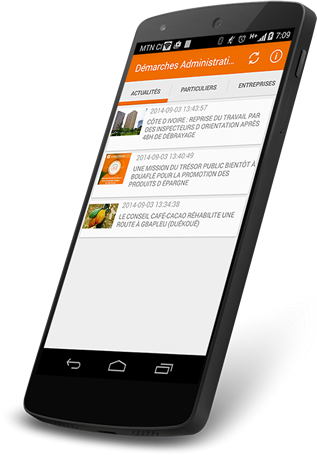 The project « servicepublic.gouv.ci » is fostered by the « Direction Générale de la Modernisation de l’Administration » (General Direction for the Modernizing of the Administration) with support from the « Agence Nationale du Service Universel des Télécommunications » (National Agency for the Telecommunications Universal Service) and from the “Centre d’Information et de Communication Gouvernementale” (Center for Information and Governmental Communication). The upper banner categorizes 3 types of procedures: individuals, businesses and associations. Within each type, procedures are sorted by themes and topics. A research bar is available to quickly find a specific procedure. Each procedure sheet gathers all useful details on the procedure: necessary documents, cost, validity duration, etc. If the online procedure is available, you can click on “Accéder au service en ligne” (Access the online service). This redirects you to the online service website. For each procedure, you may suggest an improvement using the button: « Faire une suggestion sur cette page » (Make a suggestion on this page). Finally, the banner on the left side of the page displays the latest published procedures, the most frequently initiated procedures and a section dedicated to vulnerable populations of Côte d’Ivoire (isolated women, troubled juveniles, elderly, disabled people and jobless people).